Teaching lab with 18 student computers with dual monitors and a teaching station. The teaching lab also has a projection system to better facilitate instruction. 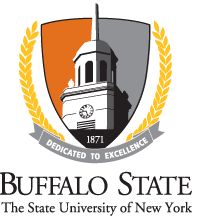 Computers in the lab are linked to the Buffalo State computer network and are loaded with ESRI Geographic Information System (GIS) software, including ArcGIS Desktop and ArcGIS Pro, Erdas IMAGINE remote sensing software and Pix4D software for processing drone imagery. The teaching lab is used to teach a variety of courses ranging from intro to GIS (GEG 325) to remote sensing (GEG 418). The water quality lab includes colorimeters and numerous meters and kits to analyze a suite of metals, nutrients, bacteria and conventional parameters. The department also maintains a groundwater monitoring well on campus that is used for class instruction and student research projects. The meteorology lab that is used for instruction, weather forecasting, and research. It includes six computers, which can be used as individual stations or used together as a forecasting ensemble. The meteorology lab is directly linked to the college weather station. Computers in the lab are loaded with ESRI GIS software, as well as with specialized state-of-the-art software applications for weather monitoring, forecasting, and broadcasting. The meteorology lab houses a micro-balance and meteorology-related equipment. Bench space is available for experimental work. In partnership with the Gerace Research Center (the College of the Bahamas), the department also helps maintain an equipped lab on the Island of San Salvador, Bahamas. This lab is used for our Bahamas Field Experience course, as well as by faculty and students conducting research on the island. The island and lab offers our students an opportunity to study numerous physical geography topics (e.g. off-shore environments, beaches, surveying and mapping, dunes, karst and caves, vegetation patterns), as well as the geography of human settlement (e.g. original aboriginal peoples, slavery, plantations, island culture) in a tropical environment. The student lab provides a place where students taking geography and planning courses can complete assignments and work on projects. Computers in this lab are also linked to the Buffalo State computer network and are loaded with ESRI GIS software and other software programs that are installed in the teaching lab. The department has two color laser printers, a wide-body plotter, and a large-format scanner.